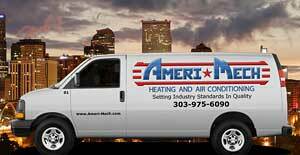 Air conditioning contractors are not all created equal in the Boulder / Denver and northern Colorado area. The best air conditioning contractor will provide quality service from the installation cost estimate, or air conditioning repair estimates through the air conditioning installation process and offer service after the sale. A properly installed central air conditioning system makes all the difference. At Ameri-Mech heating and cooling we are fanatical about the artistic placement and connection of your air conditioning installation to provide the most efficient and reliable cooling for your home and a neat appearance to go with it. Replacing your old air conditioner or ordering a new central air conditioning installation, Denver / Boulder air conditioning contractors can make a big difference between a quality installation that will last for years, or a bargain basement installation that may have issues from efficiency to longevity. Our professionals have over 20 years of experience in air conditioning repairs in Boulder / Denver / Longmont, and strive to give you the best air conditioning installation. We employ only screened and qualified technicians. Air conditioning repair service should not be a stressful experience for the homeowner. As professional air conditioning contractors we are honest, courteous and pride ourselves in quality workmanship. We are fully licensed and insured for your protection and our work is guaranteed (please call for details). Our expert air conditioning contractors are familiar with all designs of central air conditioning. A typical “split system” design is most popular in Boulder, Denver and the front range, whereby a refrigerant circulates between an indoor coil and a matching outdoor condenser with compressor. The refrigerant cools the air, a blower circulates air through ducts throughout the house. A variation is the “heat pump,” a type of system that functions as heater and cooler. When used as an air conditioner, a heat pump discharges heat from the house either into the air or deep into the ground. In the winter, a heat pump extracts heat from the ground or the air to warm your Boulder Co house. Denver / Boulder air conditioning contractors who bid on your installation should show you proof of bonding and insurance, plus any required contractor’s licenses. We are a member of the Better Business Bureau and are fully licensed and insured. It’s a plus if technicians are certified by a trade organization, such as North American Technician Excellence or HVAC Excellence, to service Denver / Boulder residential heating and cooling equipment. These and other similar programs assess the technician’s knowledge of specific types of equipment and its proper service methods. Denver / Boulder air conditioning contractors who make the effort to get certified and practice this trade and learned from several years of service and installation experience, will be a better service provider. Air conditioning contractors who bid on your residential air conditioning installation should calculate required cooling capacity by using a recognized method like the Air Conditioning Contractors of America’s Residential Load Calculation Manual. An additional reference for assessing ductwork needs is Manual D. The calculations produce a detailed room-by-room analysis of cooling needs. They should also be able to offer the latest in high efficiency air conditioning systems, and be knowledgable about your options. 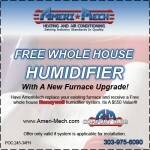 A air conditioning service plan that combines regular inspections with discounts on repairs and a labor warranty is offered by Ameri-Mech heating and air conditioning. Remember we are dealing with mechanical equipment that can run as much as 12 hours a day, for long months in the hot Boulder and front range summer, and it can cause wear and tear on the best equipment. We are expert contractors at replacing an old central air conditioning system. If you need ductwork installed because you’re starting completely from scratch or are upgrading a forced-air heating system, we can do that too. Improving the system’s air-filtration capabilities is also easiest to do as part of a general upgrade.